Thanks everyone for all of your very kind words on my shots. I do appreciate it. Wonderland photo! Do we live in the same town?lol Great angle and colors and texture. Nice water changing into ice formation. It certainly has over your way - gorgeous! Winter is here for a while for sure!! this is gorgeous margaret!! such a beautiful winter shot!!!! FAV! Ooooh very nice shot, I don't miss it though. Very beautiful winter shot! All that snow looks so pretty! This is a fabulous capture! Like how the depth and color plays in this shot, Maggie! Wonderful capture Margaret. I really like the depth captured here. Please have this enlarged, nicely framed and shipped to me. It would look so nice in my home. Ooooo just stunning but made me shiver! Beautiful shot. It definitely looks like winter and it looks like you got lots of snow. This is beautiful! We've gotten no snow to speak of to try to get some beautiful shots like this. Just perfect! Oooo... such a beautiful scene! Magical! such a refreshing shot! nice one! This is simply stunning!! Gorgeous!! A nice winter wonderland shot. Very pretty with the open water. Woah! That's quite a lot of snow! We still haven't had any yet! You have captured amazing detail in the snow. Fabulous and oh so cold! Stunning, absolutely love this scene! Fantastic! I love the tones! Beautiful snowy shot! Now that's proper snow! Beautiful shot. love this photo, not had any snow yet this season! I love creeks in the winter. How beautiful - wonderful capture! wow this is totally awesome ,love it and fave it. Wow! Looks cool & cold....amazingly beautiful...view from a tropic person. This is a crazy amount of snow. Can you drive in this? Wow, it looks beautiful Margaret. 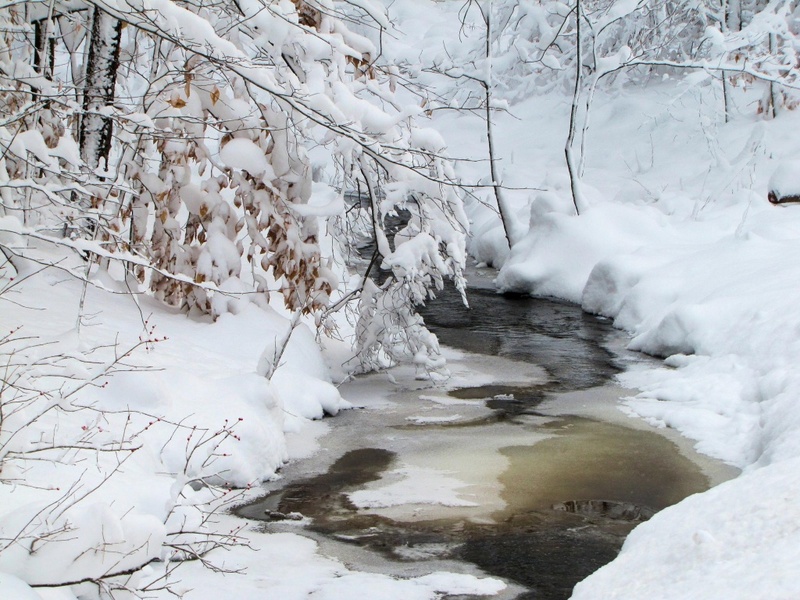 Love that feeling - I had a stream like that when I lived in NJ - loved to see it in the snow. Wow!!! Pretty!!! Don't fall in!!! Beautiful... just keep the white stuff where you are.. K???? wow....it sure look like winters here (well not here but there, lol), this is stunning Margaret, faved!! Picture perfect Maggie, just absolutely stunning! Well and truely upon you! This is lovely, winter at it's best, even if it does make me chilly! Great shot - looks like winter is there with a vengance! we got very heavy frosts - awaiting the snow! Beautiful shot! Looks like winter hit with a vengeance! Wow. Such amazing whiteness! Your lighting here is awesome.